Catherine McAuley Scholarship is an endowed scholarship established in 2006 by the Sisters of Mercy in Queensland to honour Sister Catherine McAuley, founder of the Sisters of Mercy, and in recognition of the predecessor college McAuley College. Just follow the below steps to apply for the Catherine McAuley Scholarship 2018. Step 1 : Visit the official website of Australian Catholic University provided above. Step 3 : Next, click on the “Apply Online Now” button at the end of page. 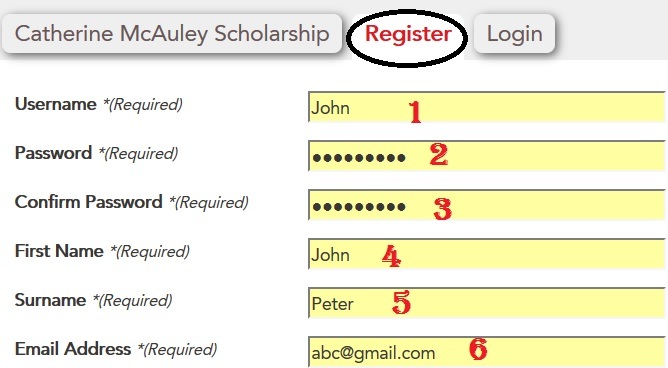 Step 4 : Click on the Register button and fill the application form with the required fields. 1. After logging in, or when registering, you will need to complete the personal information screen. Once all required fields are completed, submit your information. ** The document types that can be uploaded are .doc, .docx, .rtf, .txt, .pdf. ** If you have more than one document to support one of the criteria, scan all of the documents together and upload as one file. ** Combined file size should not exceed 8MB. ** Why have you chosen to undertake your degree? ** What do you hope to achieve with it in the future? 2. Evidence of the applicant’s involvement and/or leadership in community service through activities designed to create a more just, merciful and sustainable world. ** Evidence of contribution to community service. ** Preference will be given to applicants who are Aboriginal and Torres Strait Islander students, students with social and economic disadvantages, or students from rural and regional areas. The scholarship is valued at up to $10,000. It will be paid in installments of $2,500 per annum for the duration of your course (up to a maximum of four years).